Over the last year, or so, Project Redrum has undergone quite the transformation. No longer is it the left-for-dead, cruddy Trans Am it once was, it has since put down some impressive numbers on the dyno that you’ll read about soon enough. As mechanically mouth-watering as this car is now, we can’t overlook some of the little things that will make this Trans Am just a little bit more functional. When we first picked up Redrum, we immediately realized a slew of problems with it. First and foremost, literally all of the key locks were trashed. Apparently, the car was broken into at some point during its tenure sitting outside in an outdoor storage lot in Las Vegas. The doors and rear hatch all needed new locks and the passenger side mirror housing was busted. Trying to get out from behind the wheel proved difficult, too, as the driver’s side interior door handle was completely busted off, forcing us to open the door from the outside! A sagging headliner, missing dome light cover, faded sun visors and a cracked dash all left us wanting more from Project Redrum. Sure, the idea of the car is to have an overall ratty-theme, but we want the interior to be as comfortable and functional as possible. We’re not building a show car here, obviously, but we shouldn’t have to contort ourselves to simply exit the vehicle. To add insult to injury, the rear hatch was basically inoperable and the hood wouldn’t stay up due to the worn hydraulic hood shocks. Redrum was in dire straights. So in order for us to make it right, we went ahead and brought the car up to snuff — just enough, to make it functional and livable. We also considered upgrading the carpet, but despite the obvious wear in many other places, the carpet in the passenger compartment was holding up rather well. The same can’t be said for the carpet in the rear hatch area, but we elected to just remove it entirely. With the understanding of how much heat the supercharged LS3 will produce, we took it upon ourselves to replace the old, original sound deadening from GM, and upgrade it using Heatshield Products’ Db Armor and Db Defender. Heatshield sent us their Db Defender and Db Stealth Armor to install into Project Redrum. Being a 700+ hp track car with racing and boost in mind, it only makes sense to replace the ancient factory insulation in our Trans Am. Each of these two Heatshield products have their own benefits and both have a unique application. The Stealth Armor is designed for floorboards and trunk pans, to quell outside noise and to keep high levels of heat from the engines and exhaust from entering the cabin. We started by pulling the front and rear seats. This will allow us more access to various sections of the interior cabin. In order for us to pull the carpet out, the sail panels, seat belts — everything had to be removed from the cockpit. We’ll be reusing the original coat hooks, since they were still in perfect shape and showed no sign of cracking or fading. The rear seat won’t be going back in. Removal of the door seals is absolutely mandatory and will make carpet removal much easier. Removing the sail panels can be accomplished once you remove the rear seat, remove all of the mounting hardware and simply pull the panels out of place, around the seat belt holsters. The center console comes out in two pieces, and it basically consists of removing a handful of screws and bolts on the outside, as well as the inside storage compartment. We also had to separate the A/C control panel and stereo heads unit. It took a few minutes, but with all of the nuts, bolts and screws removed, and the stereo and air controls pulled the factory console was finally ready to come out! Like we said before, it comes out as two separate pieces, as you can see in this images. All of the original sound deadening and insulation was tossed. The 34 years worth of funk that was instilled in the insulation, as well as the rear section of carpet. …and there’s the faded, sagging factory headliner. The Db Tool allows installation of Heatshield’s various heat and sound deadening materials into your vehicle much easier! Thanks to its ingenious design, it even helps get into the nooks and crannies of the floorboards and various other body seams of the interior. The Db Stealth Armor arrives to your shop in large sheets that you will have to cut to size to fit the floorboards of you car. After some careful measuring of the floorboard sections of our F-body, we measured our Stealth Armor accordingly…. …allowing us to custom-tailor our Heatshield to the sections of the floor where we needed them to be. After lining up each section perfectly, we laid down the Stealth Armor and used the Db Tool to help the apply it evenly. As we’ve mentioned earlier, the Db Defender is more pliable than the Stealth Armor, and it’s designed to be as it’s perfect for wheel housings, inner fenders, quarters, etc. We applied ours to the wheel housings, inside the rear quarters, on the rear axle hump and on the ceiling of the car. Everything we ordered are brand new reproduction parts that are currently offered from our friends at Hawks. All of the replacement components we ordered from Hawks Motorsports are high-quality, and look just like the OEM pieces that left GM 34 years ago! Our original headliner was sagging, faded and basically looked terrible. Ditto for the sail panels and the sun visors. Hawks sent us brand new replacements. The headliner ships in a box, so you may need to give it a little time to open up and stretch out. We were pressed for time, so we shot this image shortly after removing it from the box. The headliner did flatten out on its own a few hours later. …and cracked passenger side mirror…. …and a window crank with a missing wheel. Here’s a glimpse of the much-needed inside door handle, window crank and door locks. I know, it’s not the sexiest or most exciting thing we’ve ever installed into a car, but it’s certainly necessary and will make Redrum as functional as possible. Hawks offers new replacement hydraulic shocks for the hood and hatch for GM F-bodies from ’82-02. Ours were shot at all four corners. Hawks sent us a set for the front and rear, and not only will they maker the car more functional, just as a vehicle, but will certainly help us during the build process as we’ll be in and out of the car, and under the hood, constantly. Rusted, worn and caked with Las Vegas desert sand, the original shocks did little to hold our Trans Am’s hood up. What isn’t shown, is the broom stick handle holding up our hood just to be able to take this shot. There’s two mounting points to remove these, one end pops off and the other end is held on with a clip. It’s simple to do, and it only takes a couple of minutes to replace. Here’s the new driver’s side hood shock is in place and is a stark contrast to our crusty old 305 in the background. With both in, we’re thrilled with the fact that we can now work on the engine without having to rely on a stick to hold up the hood! Our hatch lock was jammed up and wouldn’t even let us unlock the car with the key. We ultimately had to jam in a flathead screwdriver and crank it over that way. Replacing the key lock meant we had to remove the taillights, and to do so, you have to remove the locking tabs. With the taillights out, we were able to access the trunk lock assembly. As we’ve mentioned earlier, Redrum needed a lot of love in the trim department, and the dash was no exception. Underneath the carpeted dash cover, was a dash ad that looked like a road map. With years of seating outside in that hot Vegas sun, it’s pretty common for these dash pads to weather and crack. …to hide the cracks that hid underneath. It wasn’t a modification we installed, but we’re certainly going to address the dash pad the proper way. Our factory dash has more cracks and lines in it that a map of Los Angeles. It’s pretty common, but especially so with our car, that sat outside in the hot Vegas sun for decades. Thanks to the modern aftermarket, we were able to source an OER reproduction piece from Hawks Motorsports. It’s made from a similar material as the original dash, but with a higher level of quality built-in. It even comes complete with the speaker grilles on each side. The detail and accuracy of the OER dash pad is impressive. It looks like it just rolled off of the GM assembly line and all of the correct lines, markings and mounting holes. For a long time, there was nothing you really could do in terms of finding a decent replacement. You could source one from a junkyard, pay big money for a new old GM stock piece or hide it under an aftermarket carpet, like a previous owner did with ours. There are now a few options these days, but OER is certainly a high-quality option. 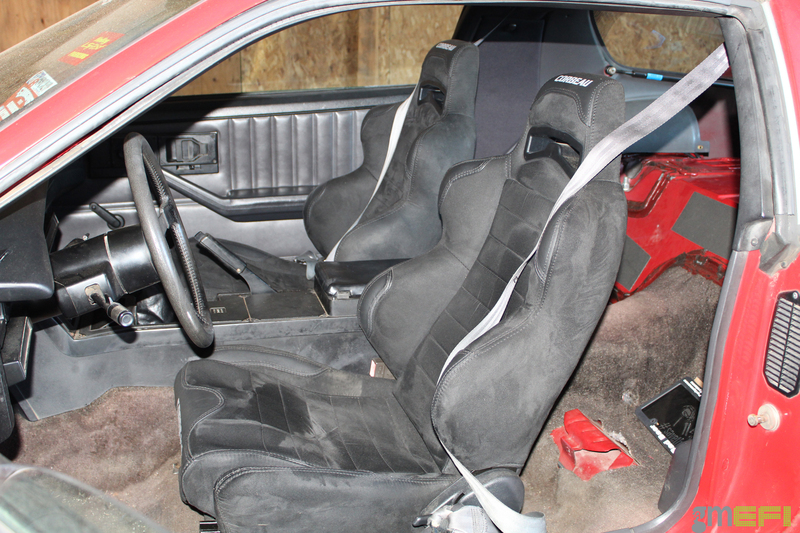 It was a great feeling to get these ragged out and stained seats out of our Trans Am. They were fine for putting around town back in 1984, but for we have planned, hey just won’t cut the mustard. See ya! There’s no getting away from the fact that our unsupportive stock seats just don’t cut the mustard in terms of needed support. They’re old, ugly, stained, they smell and the side bolsters are next to non-existent. They’re just not going to make it into the final product of Project Redrum. There are many companies out there that make high-quality seats, and just about any one of them would suit Redrum perfectly, but thanks to a previous project of ours, we were kind of stuck on the Corbeau LG1 seats. They fit the car perfectly, look great, offer tremendous support and even have the necessary previsions for 5-point harnesses, which we also picked up from Corbeau. We’ll be installing those in an upcoming update from GMEFI. Corbeau’s LG1 line is available in multiple colors, and color combinations. They’re retractable — much needed in a street car — and in your author’s opinion, are firm but still quite comfortable. Of course, it’s a matter of personal preference and we highly recommend “test sitting” any kind of racing seat before purchase. You can read more about them HERE. The suede inserts not only add a touch of class and quality to the interior, but they further help keep the occupants in their respective places. Another great thing about Corbeaus offerings, is that they make direct bolt-in seat brackets, specifically for the ’82-92 Camaro/Firebird. The seats themselves show up to your door assembled, with only the hardware and the seat brackets needing paired together and mounted into the car. The seat brackets have the provisions to mount directly into place of your factory seat mounts. So you basically replace the entire stock seats and seat brackets from those from Corbeau. Now we should point out, when it comes to third-gens, Corbeau positions their seats a little bit higher than those from the factory as-delivered. If you’re of average height (your author is 5’11”), you should be fine but if you’re 6-foot or taller, you may need to modify the brackets to position the seat lower to their floorboards of the car. If you’re shorter than 5’7, it’s probably a welcome change. If you track your car, you have to remember to have enough headroom to clear your helmet. The Corbeau seats come with all of the hardware needed, in which case, includes several Allen head screws. You can find the Corbeau text on three locations of the LG1 seats. On the front of the headrest, the rear of the headrest and on the front of the seat cushion. It also has the provisions for a 5-point harness, which we’ve also ordered, but we’ll delve into in a future installment. The bolstering of the LG1 seats offer plenty of shoulder and waist support on both sides, and even has leather accents that add a premium touch and feel. Normally, this would be a wrap. However, with our gauges still unaddressed and our 5-point harness yet to be installed, we’ll be tackling both of those issues in future updates! VIDEO: Bone-Stock C7 Z06 Automatic Clicks off a 10.38!